An unlucky coincidence of space and Earth weather in early September 2017 caused radio blackouts for hours during critical hurricane emergency response efforts, according to a new study in Space Weather, a journal of the American Geophysical Union. 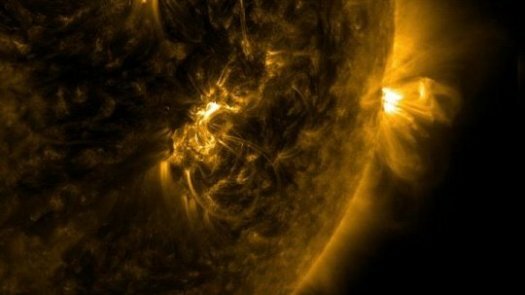 The new research, which details how the events on the Sun and Earth unfolded side-by-side, could aid in the development of space weather forecasting and response, according to the study’s authors. On September 6, three hurricanes advanced in a menacing line across the Atlantic Ocean. Category 5 Hurricane Irma ravaged Barbuda in the Caribbean’s Leeward Islands in the early morning and churned onward to St. Marin, St. Barthelemy, Anguilla and the Virgin Islands, causing massive damage. Tropical Storm Katia hovered in the Gulf of Mexico and Tropical Storm Jose approached from the open ocean. Both were upgraded to hurricane status later that day. On the surface of the Sun, 150 million kilometers (93 million miles) away, another storm was brewing. A class X-2.2 and major class X-9.3 solar flare erupted on the morning of September 6 at about 8 a.m. local time. NOAA’s Space Weather Prediction Center warned of a strong radio blackout over most the sunlit side of Earth, including the Caribbean. Amateur radio operators assisting with emergency communications in the islands reported to the Hurricane Watch Net that radio communications went down for most of the morning and early afternoon on September 6 because of the Sun’s activity, according to the new study. French civil aviation reported a 90-minute loss of communication with a cargo plane, according to the study’s authors, and NOAA reported on September 14 that high frequency radio, used by aviation, maritime, ham radio, and other emergency bands, was unavailable for up to eight hours on September 6. Bobby Graves, an experienced ham radio operator who manages the Hurricane Watch Net from his home near Jackson, Mississippi, said the flares caused communications to go down for hours. The Hurricane Watch Net is a group of licensed amateur radio operators trained and organized to provide communications support to the National Hurricane Center during storm emergencies. The new study detailing the activity on the Sun and its effects on radio communications from September 4 — 13 serves as an overview to a collection of journal articles in Space Weather investigating the solar activity of September 2017. The collision of Earth and space weather in September delivered a reminder that solar events can happen at any time and may coincide with other emergencies, according to the study’s authors. NOAA’s Space Weather Prediction Center issued warnings for potentially severe geomagnetic storms for September 7-9.